Spring is here and so is spring fever. I really have not made much jewellery during the year and have not updated my blog for almost a year. 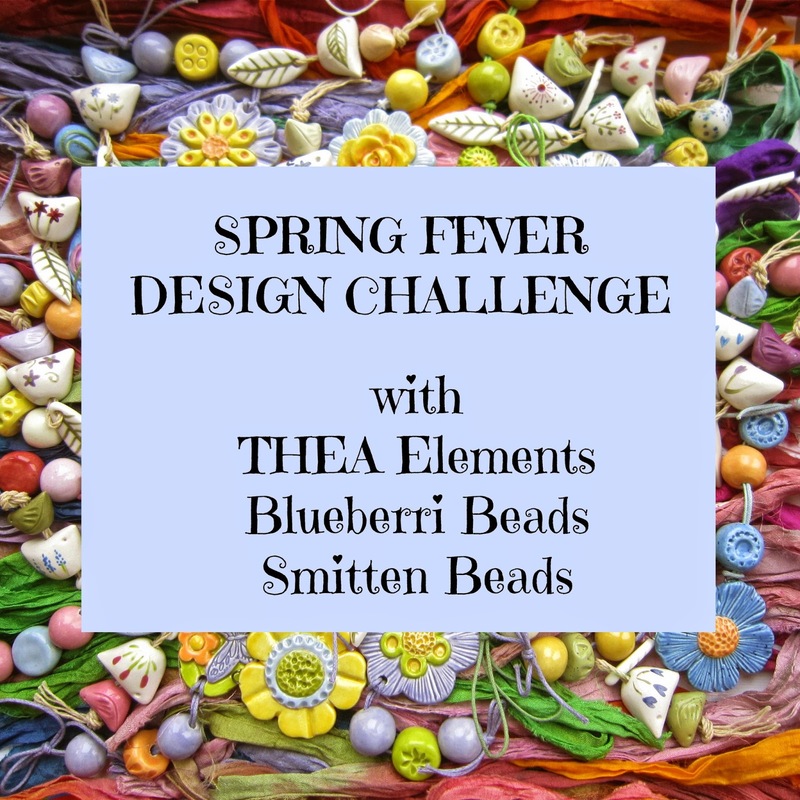 This is why it was so nice to be able to participate in a blog challenge of Thea Elements, Blueberribeads and Smitten beads. And this is what I created. The beads were so lovely I wanted to make something I could wear a lot. I work in a hospital and cannot really wear any jewellery there but a nice necklace to hang my name tag from is something I always wear there. Aren´t these beads precious! I love the little bird and the lovely flower pendant! The cinnabar type bead is from my own stash as are the red and green ones. I used cotton cord to knot the beads and added the lovely silk ribbon in the back. Adding more beads would have made this far too heavy, silk ribbon is a perfect solution, also making the necklace far more comfortable to wear. 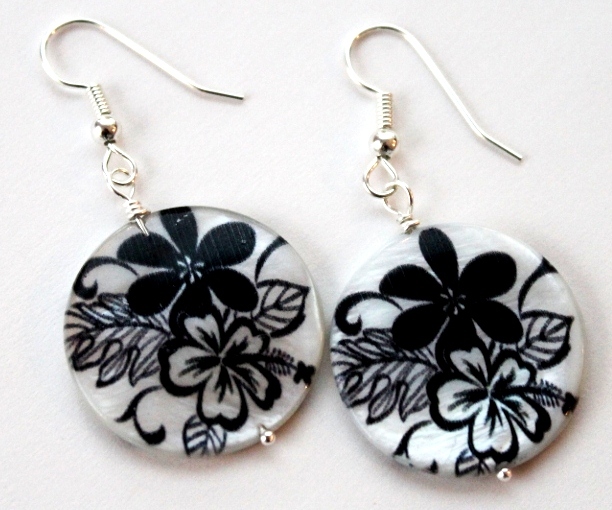 Earrings can also be worn. These are asymmetrical which is always fun, at least with such cute beads! See what the other participants have created! Out of my comfort zone - what a wonderful thing! 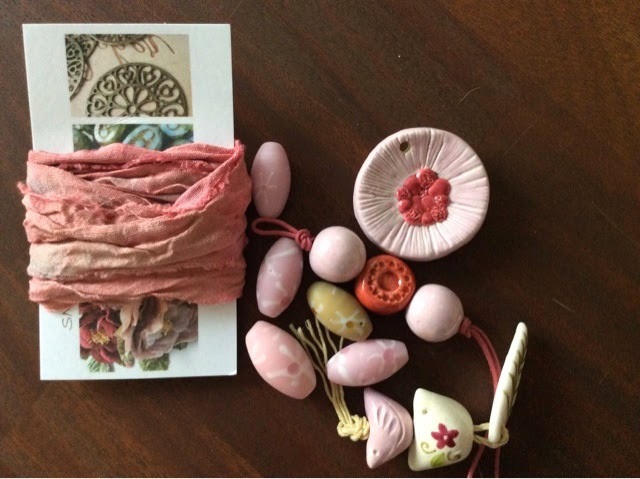 Here it is at last, 3rd Reveal of the 7th Bead Soup Blog Party, hosted by the gifted Lori Anderson. The reveal has been postponed because Lori has been ill; hope she is feeling better by now. As lovely as Karin´s beads were, the colour gold was something of a shock to me as I am out of my comfort zone there. To my amazement, I came to love the colour when working with these beads. I managed to use quite a few of them, even with my wrist in a splint most of the time. 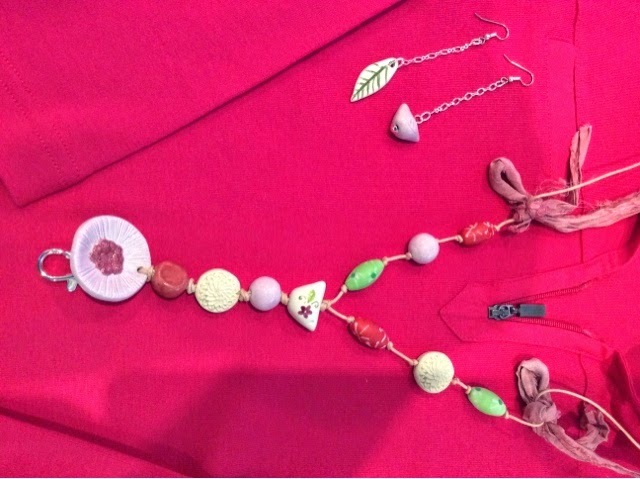 The first set uses the lovely clay connectors from Karin, for an asymmetric short necklace and a bracelet. I added chalcedony, pastel blue lampwork beads and a copper-plated clasp from my own stash. 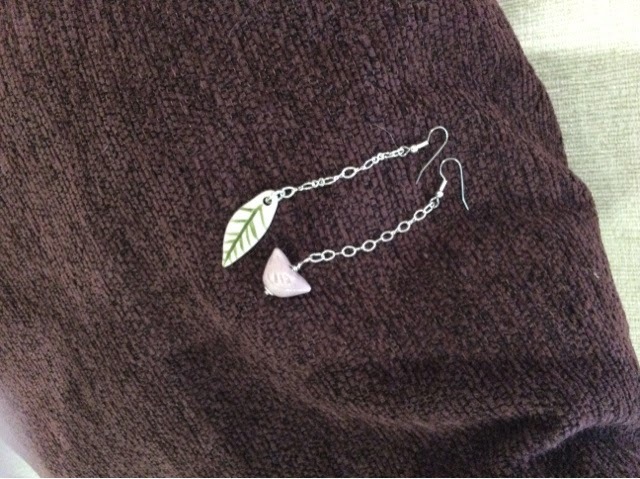 The short piece of leaf chain was purchased from New York. The colour is gunmetal, just like the Artistic Wire used to make the connections. Doesn´t baby blue make a lovely combination with brown? For the bracelet I used the same materials, adding a lovely cloisonne bead from Karin and the smaller of the clasps she sent me. 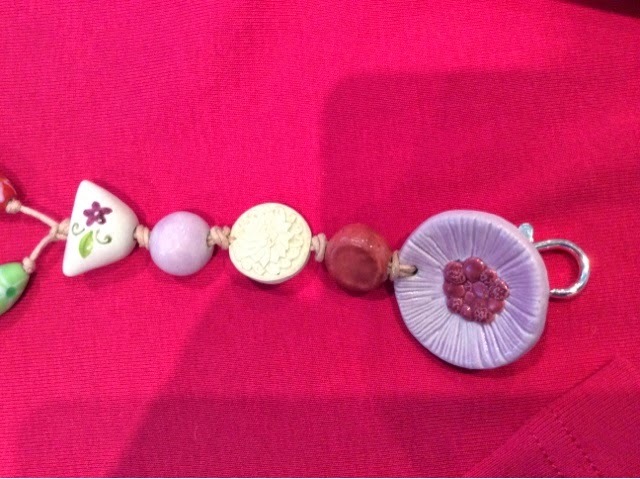 The centerpiece of my second set is the lovely big toggle clasp from Karin. For the first time in months I did some metalwork and created a bracelet. I did saw a piece from bronze sheet, hammered it a bit, finished the edges with a file and hammered it again to fit a wrist comfortably. I do not own a bracelet mandrel but a rolling pin made of marble is an excellent substitute. I connected the pieces with leaf chain in gold colour and added some crystals from Karin. They look a bit like grapes, do they not? The crystals a lovely purple colour with golden tones. By far the most beautiful clasp I ever worked with! 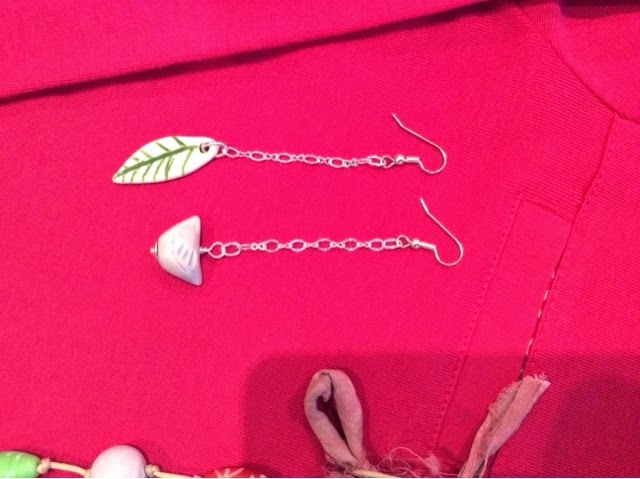 The golden leaf chain was an easy choice for the earrings as well. My last piece took ages to make because I kept changing my mind all the time. I absolutely wanted to use the lovely lampwork beads made by Karin herself but could not figure out a good way for that. I can´t say I am completely happy with what I created but here it is anyway. The lampwork beads have been wrapped with bronze wire, like are a couple of crystal beads, also from Karin. These beads are a bit larger than the ones used in the previous set. I also stringed some of the crystal beads with the glass pearls from Karin, for the back part of the necklace. There are still a few beads left fot a bracelet and a pair of earrings but I did not have the time to finish these. That´s all, folks! Greetings from Miss Tweety, our beloved Tyyne the Clumber Spaniel. Here she is, after winning a CAC and Best of breed in a local show. Näin ihania aarteita posti toi helmivaihtokaveriltani Karin Kingiltä Kanadasta! Ensimmäisenä sokeri päällä eli Karinin itse tekemät lamppuhelmet. Kuvassa eivät kauniit violetin sävyt erotu lainkaan. Karin kertoo tehneensä lamppuhelmiä kahdeksan vuotta, taitoa kyllä löytyy! 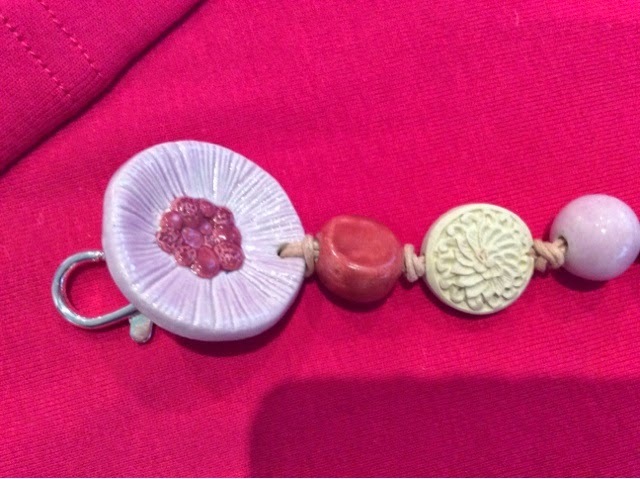 Here are some photos of the lovely treasures my bead party buddy Karin King sent from Canada. The sugar topping first: Glass beads made by Karin herself. She tells that she has been lampworking for about 8 years and you can sure see she knows what she is doing! It is a shame I could not capture the lovely violet and purple shades of the beads into the photo. Nämä savesta tehdyt linkit ovat aika ihania ja niin kevyitä. These links are claywork, light and beautiful. Sitten tämä kullanhohtoinen osuus (itse asiassa messinkiä, mutta näyttää ihan kullalta joten mitäsenväliä!) Sain peräti kaksi salpalukkoa, sieviä daisyja ja oikein kauniita cloisonne-helmiä. Then the gold part (actually it is brass but it sure looks like gold!) There are two clasps to choose from, some pretty daisies and beautiful cloisonne beads, too. Tässä vielä lasihelmiä, makeanvedenhelminauha (katsokaa, miten ihania sävyjä!) ja aivan tautisen kauniita kristalleja, syvän violetteja väriltään. And here some glass pearls in golden shades, a lovely lovely string of freshwater beads and some awsome chrystals in a dark purple colour. In this last photo the whole lot. I seem to have forgotten to photograph separately the beauriful wooden beads and the button for which I have great expectations and plans! Tässä Kanadaan lähtenyt läjä: lasihelmiä, ruusukvartsia, vuorikristallia, jonkinlaista jadea, afrikkalaista jaspista, messinkiä ja keshihelmiä. Here is what I sent to Karin who finally received them yesterday. I was starting to worry about them getting lost on the way...There are two different glass pearls, some rose quartz, large rock crystals (at least sold to me as such), african jasper, jade, brass findings and keshi pearls. Helmisoppa-ainekset ovat nyt olleet matkalla kohta viikon ja kiihkeästi odottelen, että oma pakettini saapuisi. Helmisoppaystäväni on Karin King Kanadasta, Calgarysta. Tästä pääsette vilkaisemaan Karinin blogia: http://maverickbeads.blogspot.com Karin mm. tekee itse lamppuhelmiä ja harrastaa myös siemenhelmitöitä. Hänen tyylinsä on aika erilainen kuin minun; jännä nähdä mitä tulevassa helmisopassani on! My Bead soup ingredients have been on the way for a week and I am eagerly expecting my package to arrive. My Bead soup partner is Karin King from Calgary, Canada. You can have a look at her blog here: http://maverickbeads.blogspot.com Karin makes lampworked beads herself and also does seed bead work. Her style is different from mine. It will be exciting to see what the ingredients of my bead soup will be. 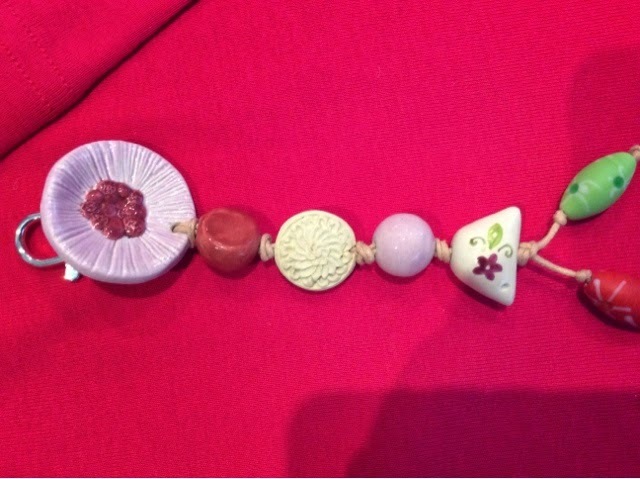 It is not allowed to publish a picture of the bead soup before the partner has received it. Thus, only a photoshopped version. Ja lopuksi kuva muusastani; Tyyne-neiti nukkumassa helmeilyhuoneeni nurkassa, lempipaikassaan. Suussa lempilelu (rikkinäinen vinku) ja alla Ikean porkkana. Ikean pehmolelut ovat kestävimpiä koiranleluja, joita olen löytänyt. Suosittelen lämpimästi! Last a picture of my muse; Miss Tyyne sleeping in the corner of my beading room, her favourite spot. (She is there right now as well). In her mouth her favourite (broken) squeaky toy and as her pillow a carrot from Ikea. Ikea soft toys are the most durable doggie toys I have found. Warmly recommended! 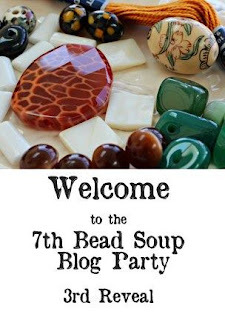 If you are a beader (and you probably are), you might know what is a Bead Soup Blog Party. That is what I have joined now, for the first time internationally. Beaders will send each other materials ( in this case a pendant, a nice clasp and beads) and make jewelry of the materials they receive. The products will be reveled in blogs on an agreed date. This soup has 500 beaders from around the world. It is unbelievable that someone (in this case Lori Anderson) has the energy to arrange something as huge as this. It is also great that I was accepted. Helmisopan ainekset ovat vielä salaisuus, mutta niitä odotellessa tässä yksi tekemistäni pronssikoruista. The ingredients of my soup are still a secret but here is a necklace I made earlier, the metal is brass. Korun materiaalina on valmista ketjua lempikaupastani Bohemiasta. Lamppulasihelmet on tilattu FMG:ltä, samoin nuo pinkit kivihelmet. Rengas ja daisy-spacerit ovat Tierra castin tuotantoa, taas Bohemiasta ostetut. Koru on aika pitkä, mutta ketjun ansiosta ei kovinkaan painava. I used chain from my favourite bead store Bohemia. The glass beads are from FMG as are the hot pink riverstones. The link and spacers are made by Tierra Cast, also purchased from Bohemia. The necklace is rather long but not at all heavy, thanks to the chain. Huh, oli vähällä Tyynen kuva unohtua ja niinhän ei saa missään tapauksessa käydä! Voi kun olisi taas kesä ja Tyynekin pääsisi uimaan! Uintiharjoitukset olisivat tarpeen, koska neitonen on vähän arvaamaton uintihommissaan. Välillä ei suostuta kuin tassut kastelemaan (eli silloin, kun pitäisi harjoitella vedestä noutamista) ja välillä taas uidaan ulapalle (sorsien perässä). Ensi viikonloppuna suuntaamme uimaharjoituksiin Helsingin koirakylpylään, toivottavasti siellä on mukavaa. Gee, I almost forgot a picture of Tyyne! That must not happen under any circumstances! How I wish it was summer again and Tyyne could go swimming. She sure needs the exercise as she is a bit unpredictable when it comes to swimming. 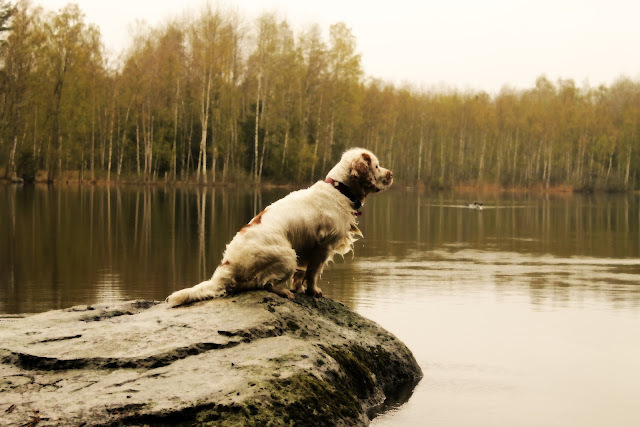 Sometimes she will hardly touch the water with her paws (that is when she should train fetching from water) and sometimes she will swim far far away (following mallards). Next week I will post pictures from our trip to Helsinki Dog Spa! Miten aika voi kulua näin nopeasti? Eli ei ole paljon tullut blogia päiviteltyä. No, jos yrittäisi tehdä parannusta. Totta puhuen korujen tekeminenkin on ollut vähäisempää. Teimme aika ison remontin ja siihen kului lähes koko syksy, lähes kaikki rahat ja lähes kaikki energia. Valmista on ollut jo pitkän aikaa, mutta energian kokoaminen otti aikansa. Jotain valmistakin on syntynyt. Tässä syksyn aikana tehtyjä koruja, aivan epämääräisessä järjestyksessä. Olen kovasti ihastunut pronssikoruihin, niissä on mukava vintage-fiilis. Tämä kaulakoru on yksi suosikeistani. Tsekkiläiset lasihelmet on linkitetty pronssinväriseen lankaan. Yläpuolella kaulakoru, jossa helmet roikkuvat edessä ja organzanauha solmitaan niskaan. Kivinä ametistia ja vuorikristallia sekä hopeoituja pikkuhelmiä. Tämä on niin sievä ja romanttinen, ettei tällainen keski-ikäinen täti sitä kyllä osaa käyttää ollenkaan. Puiset kaulakorut sopivat taas kenelle tahansa. Bohemiasta ostin aivan ihania tsekkiläisiä puuhelmiä ja niistä syntyi vaikka minkä värisiä kaula- ja rannekoruja, muutamat korviksetkin. Puukoru on niin kevyt ja mukava käyttää. Viimeisenä sitten taas näitä koirajuttuja. Jos olette miettineet, mitä rotua meidän Tyyne on niin tästä kuvasta se selviää rotumääritelmän kera :-) Korujen materiaalina tsekkilasi, ihana hopeoitu perhosketju ja hopeoidut salpalukot. Tyynen saavutuksia viime syksyltä: Komea pokaali palkintona MEJÄ-kisoista, joissa neiti sai ensi yrittämällä avoimen luokan mestaruuden ja lähes täyden pistesaaliin, 49/50. Vähän me olimme ylpeitä! Nyt kun tulisi taas kesä ja pääsisimme uusiin kisoihin! Korukopla esitti jälleen haasteen: tee kierrätyskoru, johon et osta mitään uusia materiaaleja. Heti haasteesta luettuani tiesin, mitä teen eli toteutan kauan muhineen oudon suunnitelmani. Onko tämä nyt sitten tarkkaan ottaen kierrätystä, siitä en ole ihan varma. Ei, se ei ole väärä kuva - tämän korun päämateriaali on kierrätetty meidän pienestä hauvelista. Neitosella on karvanlähtöaika, joka tarkoittaa sitä, että koko talous on kuorrutettu koirankarvoilla. En nyt sentään niitä lähtenyt lattioilta keräilemään vaan ihan pelkästään harjasta, josta niitä kertyykin nopeasti pussillinen. Tuo taaempi kasa on Tyynen karvaa, edessä oleva lampaanvillaa. Lisäksi on käytetty oliiviöljysaippuaa ja hopealangan jätepätkiä, jotka kuitenkin unohdin kuvata, joten tässä nyt koko lankakieppi. Seuraavaksi tehdään pallero, johon noin 3/4 Tyynen karvaa ja 1/4 lampaanvillaa. Mukaan vettä ja saippuaa sekä muutama minuutti pyöritystä ja voilá, meillä on käsissämme pieni huopahelmi. Korupiikit tein itse niistä muutaman sentin mittaisista hopealangan pätkistä, samoin korvakorukoukut. Ainoastaan helmihatut ovat käyttämättömät, mutta nekin niin kauan laatikossa lojuneet, että ovat ihan tummentuneet. Todellisuudessa ne ovat luonnonvalkoiset, eivät harmaat niinkuin tässä kuvassa. Täällä on satanut koko päivän, joten kuva piti ottaa sisätiloissa. Mutta noita karvoja niistä sojottaa joka suuntaan, vähän kuin Tyynestäkin. Vuosia sitten kävin värianalyysissä, silloin kun se oli niin uutta ja muodikasta. Analyysi vahvisti sen, minkä jo tiesin muutenkin: musta ei ole minun värini. Se on kyllä sääli, koska mustavalkoinen on aina niin tyylikästä. Niinpä nämä mustat korut menevät myyntiin; toivottavasti sopivat jollekulle muulle! Ainahan sitä on niitä onnekkaita, jotka voivat mustaakin käyttää. Tässä nyt pari mustavalkoista korua, joihin itse olen aika tyytyväinen. Tämä ensimmäinen setti, lyhyt kaulakoru ja korvikset, ovat todella ihanan kevyet ja mukavat käyttää. Materiaalina on helmiäinen, johon on jotenkin saatu noin kauniit kuviot. Helmet on ostettu pari vuotta sitten Lontoosta ja olen niitä säästellyt tähän asti. Lisänä pienen pieniä onyx-helmiä ja hopeanvärisiä lasihelmiä. Lukko on hopeoitua korumetallia. Toinen koru on juhlavampi, vaijeriin tehty kuten tuo edellinenkin. Kivet ovat onyxia, kauniita viistehiottuja muistaakseni 10mm kokoisia ja sitten pienempiä. Lisänä valkoista lumikvartsia, lasia ja hopeoituja välihelmiä. Hopeoidussa riipuspidikkeessä roikkuu iso viistehiottu lasihelmi, joka luonnossa kimaltaa paljon kauniimmin kuin tässä kuvassa. Luulin tehneeni tähän korviksetkin, mutta ainakaan kuvaa ei löydy mistään. Äkkiäkös sellaiset tähän tekee tarvittaessa. 50+ terveydenhuoltoalalla työskentelevä, pari vuotta sitten vaikeaan helmiaddiktioon sairastunut naisihminen. Teen koruja pääasiassa itselleni ja kavereille.